Nestled on the beautiful beach in Khaolak and just a short walk away from the beach, the Khaolak Bhandari invites you to indulge yourself in beautiful setting that pleases the eye and delights your senses. 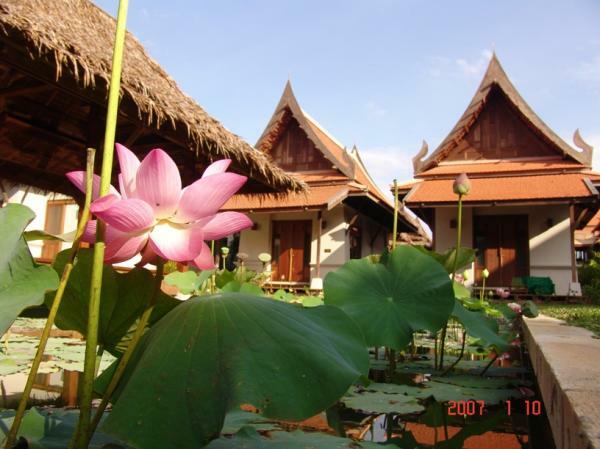 The classical Thai style resort blends perfectly into the lush surrounding. It quotes local architecture that is second to none and uses local material and art for decoration the ideal hide away for a romantic holiday in style. 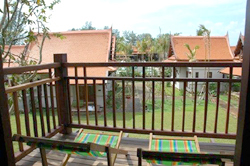 The Khaolak Bhandari Resort is the perfect snug oasis in which to unwind. This in the end is the dream: A hotel as a refuge, a piece of paradise. 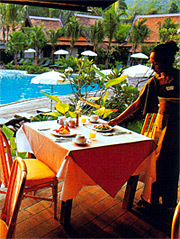 Bhandari Restaurant: an opened – air restaurant for breakfast, lunch and dinner serve with Thai and International dishes. Pool Side Bar: an opened – air bar cool off with cocktails and refreshing juice by swimming pool. Big Tree Bar: an opened air bar with a unique blend of cocktails and drinks to relax your mind in the evening with delightful music. The Bhandari Spa: The secret of Asian health and beauty. 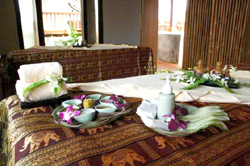 A wide range of treatments are offered, including full body massge, aromatherapy massage, foot and stress massage, body scrubs, facials (for men and women) and traditional Thai massage. Herbal steam room, sauna and Jacuzzi complete the facilities. • Free – From swimming pool 260 square meters with children pool and swirling pool. The resort Offers 77 rooms. 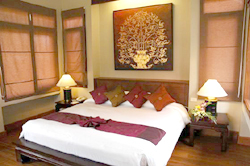 Every room decorated in Thai Classical style wooden furnishing and features Air conditioning, Mini-bar, IDD International Telephone, Satellite Channel and Movie, In Room Safety Box, Living Corners, Tea/Coffee set, Bathrobe, Slippers and Umbrellas. The bathrooms separate toilet, Bathtub and hot & cold shower enclosure with all the amenities and hair dryer. 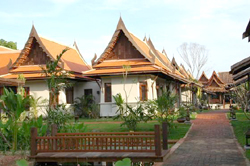 Thai Style Bungalows: 29 bungalows, each bungalow cover the area of 50 sq meters large, feel at one with nature. The bungalows are luxuriously appointed with elegant Thai décor, superbly designed with specious living corner and private balcony offering a choice of pool and tropical garden view. Thai Style Chalets: 45 rooms, each room covers the area of 48 sq meters, air conditioning room equipped with king or twin beds have large living space with polished wood floor, rich Thai fabric, original mural paintings, created a comfortable and practical environment to relax and enjoy its pristine location.